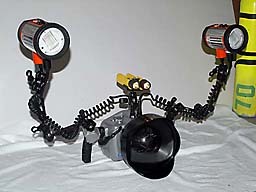 My first Underwater Camera ( fondly referred to as "the little beast" ) consisted of the original Light and Motion Tetra 3030 aluminum housing containing an ancient Olympus C3030Z ( 3 Mega pixel ) camera. This camera eventually developed a couple of dead pixels in it ( after about 2 years of heavy use ). It takes great pictures, and I still use that camera as a back up ( a good example would be the sixgill shark photos I took in August, when the ROC controller failed on my big housing ). My second generation housing, which consists of a Light and Motion Titan D100 aluminum housing containing a Nikon D100 digital Single Lens Reflex camera. I shoot wide angle most of the time using the dome port and either a 12-24dx or 16mm fisheye lens. For Macro work, I use the flat port and a Nikon 60 mm macro lens. I typically use a pair of Nikonos SB-105 strobes on the big housing and a Sea and Sea YS90 on the Tetra. The Nikonos strobes seem to produce a lot more light, and I saw huge differences when taking wide angle pictures in dark caverns. For Macro work, the Sea & Sea strobe seems to offer better control. My current, third generation housing is another Light and Motion Titan housing for the Nikon D200 camera. The electronics and controls for this housing are much easier to use and are much more reliable than the electronics in my older D100 housing. They now rely on a USB connection with the camera, which makes life simpler and much more reliable. I have also switched to a pair of Ikelite DS-125 strobes, which I have found to be very reliable with extremely fast recycle times (plus, I can find the controls in the dark - very useful for cave photography). Light and Motion has provided spectacular service and support, which is why I'm on my third L&M housing. I once shipped my housing to them on a Tuesday, and they had it back to me by Friday. They paid for the shipping and the service. They are truly a pleasure to work with. One of the best features of the Titan housings is the Remote Optical Control system (ROC), which makes controlling the strobes a breeze. I simply dial the strobe power up or down as needed rather than constantly changing my f-stop and shutter speed (tres cool). Wide angle photography allows you to get very close, which reduces the amount of water between the camera and the subject. In the turbid waters of Puget Sound, getting close is mandatory, as well as using the right strobe placement in order to control backscatter. You want your strobes to paint your subject with light, without illuminating any of the particles in the water between the lens and the subject. Remember that objects are actually further away than they appear, so you must aim behind your subject. 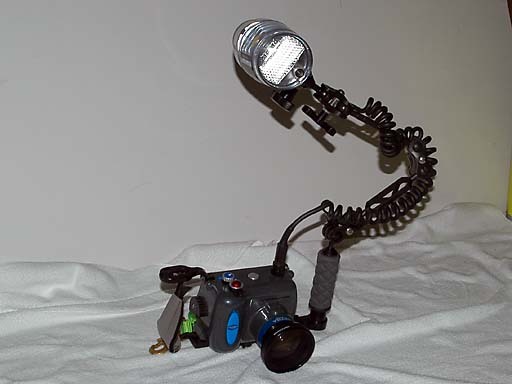 Another item that I have found necessary in the dark waters of Puget Sound is a modeling light. Using a pair of UK mini-Q40s allows the camera to actually focus on the subject that you are shooting. Without the modeling light, I found my pictures were often fuzzy. The strobes easily over power the modeling light, so there are no "hot spots" in the pictures. When loaded up with the modeling lights, two strobes, the camera, the 12-24 dx lens, adaptor rings, the dome port and batteries in everything, the "Beast" weighs over 25 lbs. It's a handful out of the water, and is like trying to push a sheet of plywood through the water when you're swimming, but it take's great pictures, and I feel naked diving without it.